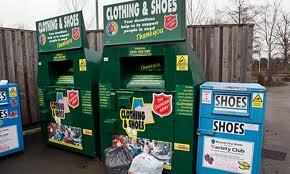 Image: Salvation Army collection bins in a supermarket car-park in the U.K. The Salvation Army is the main beneficiary of donations of disused clothing items, which are people are led to believe, normally, sold through its thrift shops. The process is meant both to provide cheap clothing, and to yield profits for the organisations other charitable activities. Recycling donated clothing is both very profitable, and very competitive – so much so that many charitable groups have brought in the professionals. It is not known how the business operates in Australia, because the Salvation Army does not offer up the information, and has no obligation to provide it. However, due to an investigation by the Guardian newspaper, in the U.K. something of the murky world of clothing recycling has been revealed. Most people assumed, since there was nothing to say otherwise, that all profits returned to the Salvation Army. Not so, apparently, although the Salvation Army accused the Guardian of “selective reporting”. The professionals the U.K. Salvation Army brought in were Kettering Textiles. The involvement with this company goes back over 20 years. The Salvation Army Trading Company looks after their business interests in the U.K. While they technically have an obligation under British charity laws to get the best value possible, it is not required to put anything to tender. The clothing recycling business was not put to tender, but simply awarded to Kettering, whose 78% major shareholder, Nigel Hanger, just happened to be a member of the board of the Salvation Army Trading Company (SATCoL). Kettering has the exclusive contract to sell the donated clothing. The astute observer of the Salvation Army knows that, whenever it is caught out doing, or saying, something very damaging to its reputation, it immediately puts out a counter-statement putting a nice spin on it all. The Kettering – clothing matter was no different. Indeed, the media, and many clothing donors, were concerned about Mr. Hanger and his company. The Guardian revealed that, over a three year period it studied, Hanger and his fellow Kettering director, received over $15 million and SATCoL got about $25 million. For the three years to March 2010 Kettering’s highest paid-director received an average salary, bonus and pension contribution of just over $1.5 million each year – a considerable sum for a business with a turnover of less than $30 million, the Guardian reported. While donors would assume the clothes were being sold through Salvation Army thrift stores in the U.K., Kettering had also been sending the clothes to be sold through retail stores in Eastern Europe. The formation date of 1991 for SATCoL coincides with the fall of the Soviet Union and the opening up of markets in Eastern Europe. Since the economic downturn resulting from the Global financial crisis of 2008, the price of second-hand, or recycled, clothing has soared. The Charity Commission said it was examining the case to see whether they would take any further action. “We are looking into it,” said a spokeswoman. “We are considering whether there is a role for us; it is being assessed at the moment.” The Fundraising Standards Board, the fundraising sector’s self-regulatory body, will also look at the issue. Eventually, all of these bodies said the Salvation Army had done nothing illegal. The only breach of the rules was a failure to state clearly on bins and bags, the nature of the profit split with Kettering. The fact that people who donate the clothes think the bulk of the money raised from sales will support the Salvation Army, has forced the charity to be more forthcoming about its dealings with Kettering Textiles. “Lt. Col.” David Hinton, chair of the SATCoL’s board of directors, said that the charity is now planning to place a statement on all its clothing banks around the country, so people are made aware that it gets a lot, but not all the proceeds, from sales of donated clothing. The Salvation Army had a unique solution to its PR problem with Kettering. Last year, in what is believed to be a first, in the U.K. at least, the charity purchased a commercial enterprise, Kettering Textiles, for somewhere in the vicinity of $15 million to $18 million, making its owner, Mr. Hanger, even richer. According to the company’s latest annual return, 78% of its shares are owned by Hanger, and the rest by fellow director, Luigi Orsi. That should have solved the problem of how much of the raised money went directly to the Salvation Army, but there was a three-year transition clause (still in force) giving Mr. Hanger even more money. He still gets to keep a third of the profits from sales for those three years. The company made a profit of about $1 million in the six months to March 2012, compared with profits of $6 million for the previous 18 months. Hanger took about $500,000 in salary and pension, plus a share of the $750,000 dividends. Kettering bosses, including Hanger, will continue to operate the clothes recycling collection. “Lieutenant Colonel” Ivor Telfer, the new chairman of SATCoL, refused to say how much they would be paid, only that it would be “in line” with salaries in the trading group. The best paid director of SATCoL last year received about $200,000. It is not known how much Hanger and his fellow directors have earned from Kettering since the Guardian’s investigation in 2011. The company has not produced accounts beyond March 2010. Mr. Kettering himself has been up-front about his motives. “At no point have I ever not said what I am in this for. I am in business to make profit as best I can in the proper manner and to make as much money for myself and my family.” Mrs. Kettering told The Daily Telegraph her husband had been hurt by accusations that he was exploiting people’s charity. 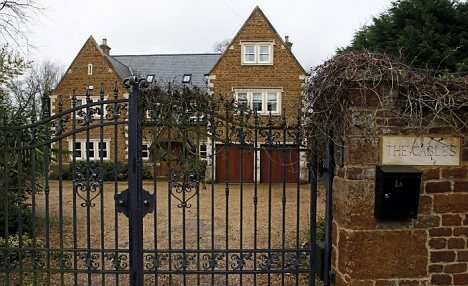 The couple lives in a large, recently built $2 million manor house-style home in the pretty village of Finedon, outside Kettering, Northamptonshire. Truly, a case of (turning) rags to riches, courtesy of the Salvation Army, the friend of the poor. This entry was posted in Uncategorized and tagged Australian Royal Commission, Australian Royal Commission into Institutional Responses to Child Sexual Abuse, charity clothing donations, Charity Commission, Kettering Textiles, Lewin Blazevich, Lewis Blayse, Nigel Hanger, Salvation Army, Salvation Army Trading Company, Salvos, thrift stores. Bookmark the permalink.